The lenses that come bundled with most DSLR cameras aren't alway the best. In fact, they are some of the most inexpensive lenses that the manufacturer produces so that the price of the bundle can be kept to a minimum. These lenses aren't bad, but they're not fantastic either. A higher-quality lens will not only give you sharp photos with wonderful contrast, but they'll also help you achieve that highly sought after blur effect that you see in professional photography. A "prime" lens is one that does not zoom. It has a fixed focal length and requires that you move towards or away from your subject instead of using a zoom. These are the types of lenses that I recommend for shooting photos of your paper crafts since you can easily move closer or further away from your paper project as necessary. You'll get an amazing lens for less money since the manufacturer doesn't have to include the zoom feature. Many professional photographers also use prime lenses for portraits since the subjects are usually still (they can move toward or away from the subjects a.k.a. the photos are staged). Good quality zoom lenses are great for everyday use, portraits, landscapes and everyday photos. The image quality won't be as good as the prime lenses above or the high quality zoom lenses below, so if you're strictly looking for a lens to shoot your paper projects with, stick with the prime lenses above, but if you want a versatile lens for paper project photography as well as a lens that you can take with you for family photos or landscape photography, one of these will do. Note: These are slightly better than the types of lenses that are usually bundled with the camera bodies. These lenses are great for shooting your paper projects as well as portraits, landscapes and everyday photos. Warning, sticker shock ahead! It's important to keep in mind that this article is focused 90% on taking photos of your paper projects and 10% on taking photos of everything else. 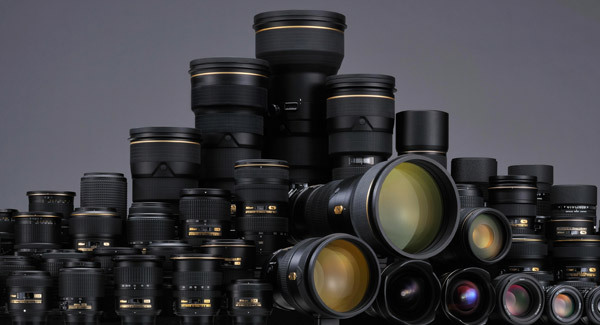 Lenses come in all shapes and sizes and each one (prime, zoom, telephoto, macro) is used for specific applications. In a nutshell, to get the best possible photos of your paper projects under $200 dollars, you'll want to stick with the lenses in the "High Quality Prime Lenses For Paper Crafters" section at the top of this post. While the lenses in the "Good Quality Zoom Lenses" section will get the job done and give you more versatility so you can shoot portraits, landscapes and everyday family photos, the results won't be as good as the "High Quality Prime Lenses" when it comes to paper crafts. The "High Quality Zoom Lenses" are the holy grail for shooting paper projects as well as everyday photos, but they come with a cost. And finally, the Telephoto lenses (in my opinion based on experience) are THE best lenses for product photography as well as sports photography (or anything else that requires that you be able to zoom in close from a distance). Jeannie, this post is for DSLR cameras. Do you have the Olympus E-5? I know this wouldn’t be much use in crafting, but what would you recommend for a wide angle lens? Thank you for a very informative post. I just got a new DSLR and I will definitely be saving for a new lens. That is if I don’t spend all my money on your SVGS. LOL! This is great info for when I get a DSLR (I’m still in the process of convincing my husband I NEED one lol). I’d love to know what camera you recommend for a complete newbie! I have a point and shoot and I was pretty satisfied with it until I started taking pictures of my SVGCuts creations. I put them up on my blog and they look OK, but not what I’d like. Please keep writing more photography/camera related posts!